This $3,000 USD Saber Gas Grill uses a unique infrared technology to make it more efficient, reliable and easy to use. Saber is a sister company of Char-Broil but aims at a much higher market. This Saber Elite is constructed entirely of stainless steel, and good quality stainless, right down to the nuts and bolts. It is well constructed and designed to last for a very long time. While a true infrared grill, this isn't the style that reaches ridiculous temperatures. The cooking temperature of this gas grill reaches more than 700 degrees F, but the true value of this cooking system is that it can hit these temperatures with a dramatic reduction in fuel consumption and without the risk of flare-ups. This is a simple gas grill that is very easy to use. Complete 304 stainless steel construction. Comes with a full rotisserie kit and cover standard. Water will get inside the grill and drip pan if left uncovered. Three 8,000 BTU stainless steel tubular burners under stainless steel infrared emitters in separate and independent heat zones. 500 square inches of primary cooking area for a total of 675 square inches of grilling space. 24,000 BTU maximum output from the main burners. 18,000 BTU dual burner side under a flush mounted cover. Stainless steel U-shaped folded sheet metal cooking grates. Individual temperature gauges for each burner mounted above burner knobs. Two internal halogen lights (grill must be plugged in for lights to work). Cover and rotisserie system included. Convertible between Propane and Natural Gas. Made in China by Saber Grills and sold through specialty retailers. A few years ago, Char-Broil's parent company W.C. Bradley decided to take advantage of Char-Broil's infrared technology and launch a new product line, Saber Grills. Saber is a completely independent company with separate management, design, and development, but relies on Char-Broil's purchasing and shipping power to hold down costs. What Saber was tasked with, was to build a better gas grill. Using an improved version of the Quantum infrared technology, these grills turn a low BTU output into high-temperature grilling. The real standout feature of this grill, however, is the attention to detail and quality construction. Saber is uncompromising in these areas, even if that means charging more. Like conventional gas grills, this Saber grill has three stainless steel tubular burners in the bottom. In this grill, the burners are in separate boxes so that heat generated by each burner has a heat zone of its own. The burners focus their heat on a stainless steel sheet of perforated metal that sits directly under the U-shape cooking grates. This means that virtually no drippings get through and little hot air reaches the food. Cooking is completely in contact with the hot grates and heat radiated by the metal emitter and grates. This means a dryer heat, but with very little airflow to rob foods of their moisture. For the griller, the important part really isn't how it works. The design is actually quite simple. What is important is how simple this grill is to use. Since grease never reaches the burners this grill doesn't have flare-ups. The infrared heat is evenly distributed and the airflow through the cooking grates actually reduces the risk of foods burning. As far as gas grills go, this might just be the least problematic grill ever made. It is practically foolproof and if you haven't grilled before you don't have to worry about learning to use this grill. Don't be fooled by the hype, though. This gas grill isn't radically hotter than most gas grills on the market. The "undergrate" thermometers read about 100 F higher than the actual cooking grate surface temperature. 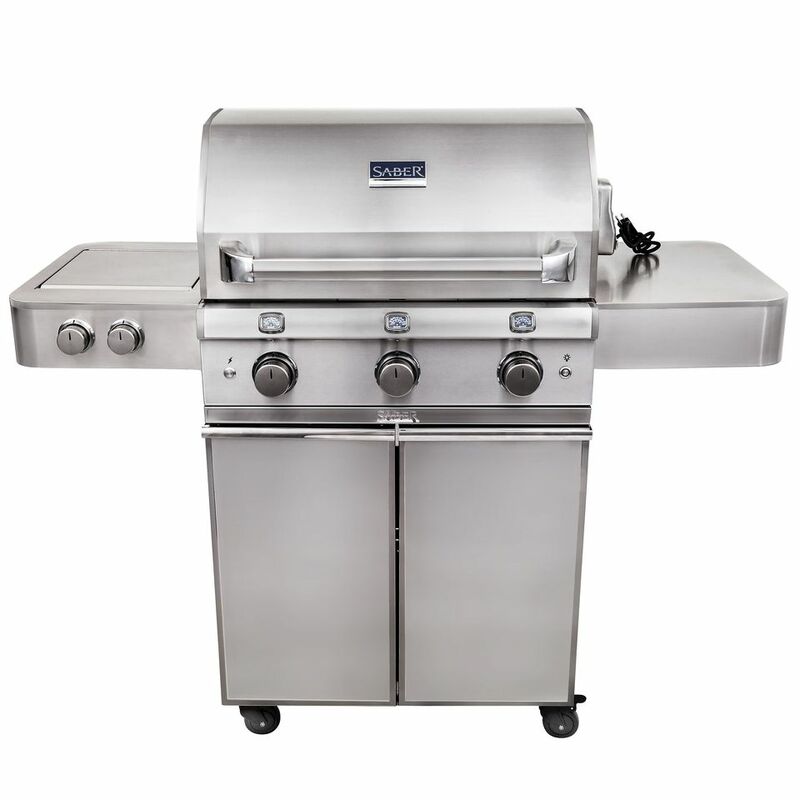 The Saber SSE1500 is a standard sized 3-burner gas grill. This model has a unique side burner. The dual-burner side can pump out 18,000 BTUs making it very powerful and one of the best features on this grill. True, side burners are one of the least used gas grill features, but that is partly due to their lack of real power. This is a serious side burner that is worth firing up. Additionally, there are internal lights for grilling in the dark (grill must be plugged in for lights to work). The ignition is battery powered and there is an igniter on each burner so the grill doesn't need to be plugged in order to function, just for the lights. As with any good grill, there are a few small issues with this one. The most notable is the rain. Of course, you should cover your grill and this one comes with a cover. When rain falls on the hood of this grill it runs down the front and some of it pours inside, filling the full-width drip pan. Since very little drippings will ever reach the drip pan it won't make the same kind of mess that happens when water gets inside other grills, but it is still an annoyance. Saber grills are not a mass-market product and are only available through specialty retailers. See the Saber website to find a dealer near you.